What size mat should I order for my business? The door opening helps determine the appropriate size of your floor mat. 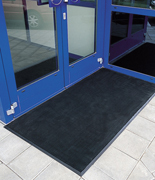 The width of the entrance mat should be least 80% of the width of the door opening, where the mat is located. Needless to say, a business with double door entrance needs more width in their entry mat. The length of the mat should allow for at least two steps, so the moisture and dirt does not end up on the interior floor. The entrance mat thickness should allow for ample clearance so the the doors can open and close easily. Should I locate my entrance mat inside or outside the front entryway? If the mat is located where it is exposed to rain, slush, snow, or ice, it is imperative that the mat traps moisture and dirt effectively. 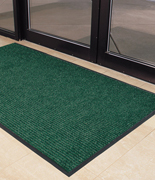 An entrance mat located in the lobby or in a protected entryway does not need not to be resistant to the weather and elements. 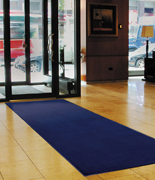 Entrance mats located inside is the best way to help ensure a clean business lobby. USA Building Supplies logo mats are the ideal way to support your corporation or organization's image. 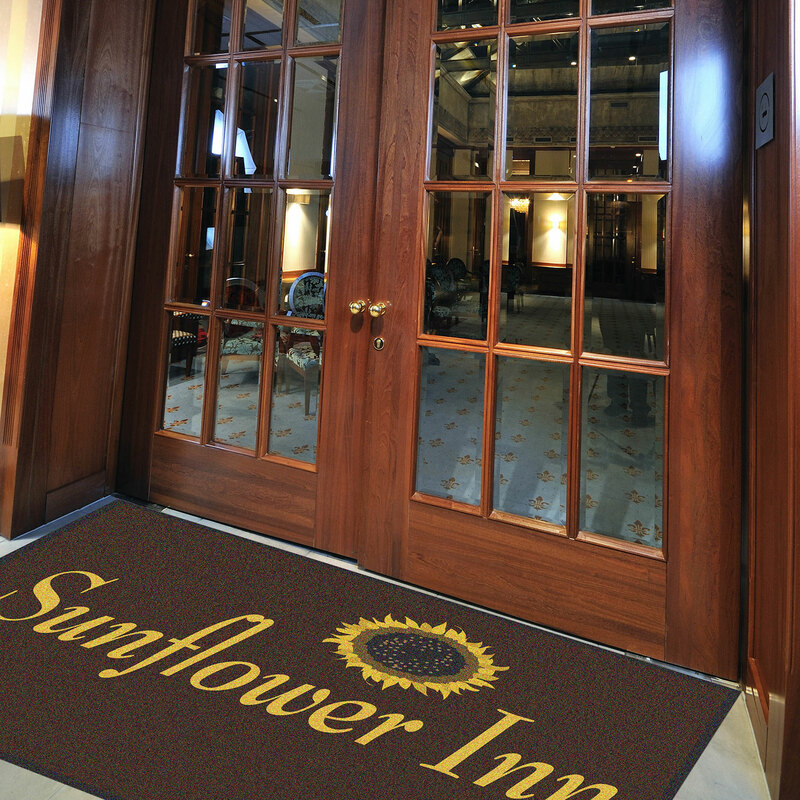 Logo mats unite the advantages of an entrance mat with an attractive design that can boost your branding and marketing efforts. USA Building Supplies utilizes a state of the art printing process to ensure an eye-catching appearance, while offering superior performance. Logo mats are assured to stay in place with our heavy duty PVC construction that creates surface friction. Eight different size choices are available to accommodate different size entrances. After the prospective customer determines the ideal size for the entryway, a decision must be made for the logo layout between horizontal (landscape) and vertical (portrait) orientation. 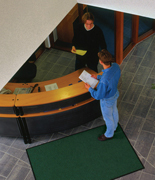 The prospective client must decide on the background color of their floor mat from twenty two color choices. Finally, USA Building Supplies state of the art website allows you to submit your logo to virtually assure you of a stress free purchase. Once your logo mat order is received, our design department will review your order to make certain the color combination choices of background color and logo ensure a quality appearance. Contact a USA Building Supplies' logo mat expert today for assistance. 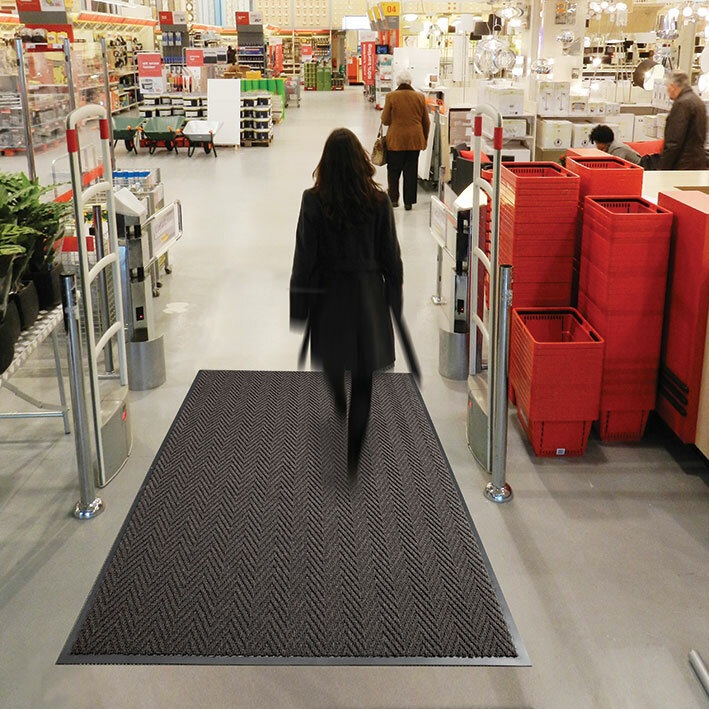 Contact the building supply specialists at USA Building Supplies for information on our full line of Entrance Mats, Anti-Fatigue Mats and Logo Mats or CALL 1.855-373-5381.